Exporting is too complicated and too risky, right? It's a monumental project which will consume resources in management time and attention and money. You've heard the myths and reasons why it's too much....and so you concentrate on your main domestic business. But what if you didn't have to think of domestic vs. international prospects & customers? What if prospects and customers that matched your ideal profile found you? Companies whom you could sell profitably regardless of where they were in the world? That's not crazy....it's entirely feasible and this 10 page eBook lays out exactly how digital marketing simultaneously overcomes the biggest hurdle to export sales growth AND helps B2B companies grow domestically at the same time! Download the eBook today for an easy to read overview of how the combination of these two mega trends - digital and global - vastly simplifies the process of expanding internationally. Barriers to export have fallen. Transactional issues are relatively easy to manage. It's finding the customers that's key and this guide shows you how your company can do so successfully, with a much smaller investment of resources than traditionally assumed. 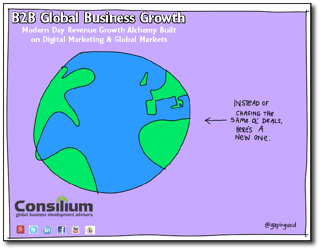 Written by someone who's been there and done that (with a really unique combination of recognized expertise in both disciplines) this guide boils an effective global growth methodology down into an easily digested overview.